Do you love to cook and recreate your mum’s recipes at home? Cooking at times can be tedious and if you are in hurry, quite difficult. But, now cooking can be fun since Hyundai brings you an exclusive piece of mixer grinder. With a mixer grinder at your disposal, you now never have to worry about spending too much time in the kitchen or putting in too much effort. Whether it is mincing meat, garlic or processing the stuffing for your favourite dumpling, the Hyundai HMB5W3S does all that and more efficiently. It also has three different containers to help you grind, mix or whisk different kinds of food items. The smallest jar can be used to prepare both dry and wet grinded food items like masala powder and chutney. 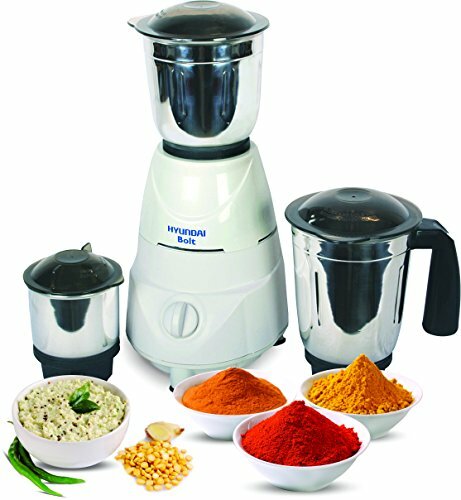 The 0.7 litre dry jar can be used to grind and mix different kinds of solid and semi-solid food items. 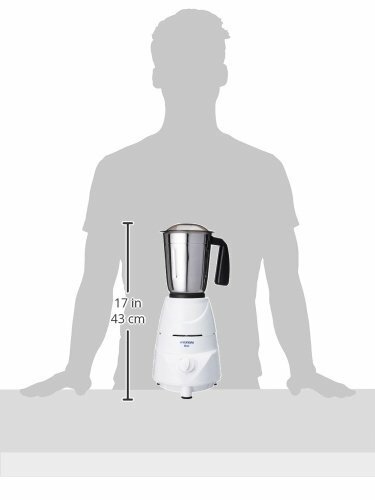 The 1.25 litre liquid jar can be used to prepare milkshakes, juices and more. All the three jars are multifunctional and can be used to prepare a variety of dishes. So, stir up the cook in yourself and get started with the Hyundai Mixer grinder. Made of top quality stainless steel, these jars are safe for food. Since they are rust proof, these jars will last you longer. The blades are also sturdy and precise and sport unique structures to facilitate quick and efficient grinding and mixing. The body of the mixer is made of sturdy plastic and features a regulator and vacuum feet. It also features smart sensor technology to help you with quicker processing. So, without any further delay place an order for this Hyundai Mixer grinder online at Amazon India and enjoy exciting offers on your purchase.